Well, sweet One, December has been quite a month. For me (your Type A Mom!) it was a month that will go down in the books as one that reminded me that even with all of the best intentions sometimes plans can go sideways and coming up with a Plan B can be good, too. I will also remember this December as one that beckoned even more strength than usual. With the holiday season our broken hearts seem more broken than ever and I realize that the jagged edges of losing you have not smoothed over time. Some things are just not possible and not having you in our earthly world will always be the most painful thing to endure. No matter the day, the month or the year. In mid December your biggest brother became ill and we learned that his appendix had unfortunately burst. With that came an emergency surgery followed by 11 days in hospital. Not only did he spend his 28th birthday in hospital but as Christmas Day approached there was the probability that he would have to remain in hospital due to the serious abdominal infection he was fighting. It was an easy decision to accept that we’d forego Christmas in Fernie as Christmas without Justin was never an option. My favourite gingerbread boy. The one you made. So Plan B ensued and Dad dug out the tiny artificial tree from the basement and brought up the box of Christmas decorations that I opened only once since losing you. That box held all of the special handmade ornaments that you boys made in kindergarten and elementary school – those special Christmases when magic pumped through your veins and through our house right down to bells on boots and zipper pulls, special Santa pillowcases and advent calendars and boxes and cups of hot chocolate stuffed with marshmallows while reading Christmas books in our jammies. The first Christmas without you I’d pulled out only a few to take with us to Fernie where, out of mere survival and the need to have certain special things in our midst, we began a new tradition. Our new Willy Christmases are all about you. Your Santa hat or toque has replaced the angel figure that used to grace the top of our tree and we adorn the tree branches with all of our family ski passes over the years. Each year I have added sparkly snowflakes of all colors and sizes, fuzzy snowballs and the glitteriest things I could find. All the while I’d not forgotten that at home was that very special box of Christmas treasures and one that I knew one day when I was ready I’d open again and cherish more than I had ever before. Well, that day did come and though I might not have been ready it seemed the right thing to put on our little tree. And so I did. And it was beautiful, Will. As each day brought us closer to Christmas we continued to pray that Justin would be well enough to come home and each day we’d hear again the “not today” news. We decided that if Justin couldn’t come to us, we’d take Christmas to him. With a heavy heart on Christmas morning I went upstairs to bathe and dress so we could go to the hospital and when I came down the stairs what to my wondering eyes should appear, but Justin and Amy sitting on the couch in our living room in front of our little tree. There were only two things I could do, Will. One was to cry and the other was to hold on to the stair railing so I wouldn’t fall. For the rest of my life I will always remember that moment of surprise and how my heart burst. Oh, how I love a love burst! We had a wonderful day complete with Christmas dinner and though Justin needed to return to hospital that evening we knew that if they’d allowed him a day pass that a hospital discharge was not far away. Our wish came true the next day. As I look back now this last day of 2016 I think about the love bursts of the year and am refilling my heart with the happy moments that will help sustain me as I flip the calendar to a new year and another painful reminder of the passage of time. I think about all of the signs you continue to send our way — the magical rainbows, the sunspots and the beautiful sparkly snowflakes that can only be you. I think about another successful Ride For Will and how your legacy just keeps on keepin’ on. I think about Justin marrying his Amy and the girl that we are delighted to have as part of our family. I think about Ben and the love for the outdoors that is his passion and the exhilaration and anticipation that comes with completing his last year of university. I think of Dad and how we continue to hold each other in happy times and how we find comfort in each other’s arms when the world is too much to bear. I think of Finn and how much joy he brings to our home and I swear that lurking behind his knowing eyes are your eyes and a place I often look to for love bursts. For all of these moments I am grateful and when I wake tomorrow to 2017 I will continue to fill my heart with all of these moments while I search for and cultivate more. I love you, Sweet Will. Like a bus full of love bursts and sparkles and glittery things and all the things that I cherish most in my life… you, your brothers, your Dad and our big, brown dog. When our world was perfect. As November wanes I find myself between reflecting on the happy moments of this fall and then trying to wrap myself around how I will find the gumption to face another December and the painful feelings that come with the holiday season. This October 22 was one of our happiest days as we witnessed your big brother marry the love of his life and the girl we, too, love to bits. I can’t help but wonder, Will, if maybe you had something to do with them marrying on a 2-2 day thinking that a sprinkle of happy was what we needed going forward and that perhaps having a happy measure of time would make it a little easier for us on the 22nd day of every month? It wouldn’t surprise me since all of your short life you were all about spreading smiles and cultivating happiness. I must also tell you, Will, that being the only female in a family of five, for me it was a wish come true that our family has grown to include a daughter-in-law. The only sad part for me was that in a perfect world you’d have been there too and that your Willy shenanigans would have been part of their day. I wish you and Amy would have had the chance to know each other. I do know you’d love her as we do. Tomorrow will be the first day of December and the heaviness I feel not only typing the word “December”, but also hearing and saying that word conjures up an emptiness that just never goes away. We’ve done this December thing now for five years and one might expect that it should be easier for us but it just isn’t. I do try to find love and light in each of December’s days but there are times when I have to dig real deep and sometimes to no avail. Amongst them, however, we find a jewel here and there – like Justin’s birthday, for one. December 17th always makes us smile but there is no denying that when you were here to celebrate with us the day was just better. As November wanes and I wake to the first sunrise of December I will take a big, deep breath and before I open my eyes tomorrow morning I will take a moment longer and feel you in the deepest parts of my heart. I couldn’t love you more or miss you more than I already do and you will always be the first person I see before I open my eyes. I will think about all the sparkles that you are waiting to sprinkle upon us and the love and light that you want us to feel so deeply. We will find some smiles in our December days but you must know, Willy, that our smiles were the biggest and the brightest when you were living December with us. I love you, sweet Will. Bigger than a bus and, as November wanes, brighter than a super moon. Yesterday was a 2-2 day. Another mark on the “when our world was perfect” scale and like all the days that mark the 22nd day of each month this day just always gets me. The 2-2 days seem to be a little more difficult than all the other days. I’m certain that even without a calendar my body has come to know when it is the dawn of a 2-2 day because as soon as I wake the rhythm of that day changes. It stops. I stop. I spend much of that day preoccupied with thoughts of you. I time travel back to the days and years when our world was perfect because you were in it. We didn’t know it then but we sure know it now. Before the rain yesterday I took Finn out for a walk and as we meandered along our usual path by the river I noticed a wishing stone. I stopped and picked it up (of course I did!) and as I rubbed it between my fingers to clean off the dirt I thought about what I would wish for. It’s always the same wish and even though I know that in my lifetime it cannot ever come true I still wish it. Every time. Why? Because one day, Willy, when my life here is done my wish will come true. And that’s what keeps me keepin’ on. Until then I will ride the wave of the days that mark the 22nd day of each month and I will think of you and time travel back to our days together. 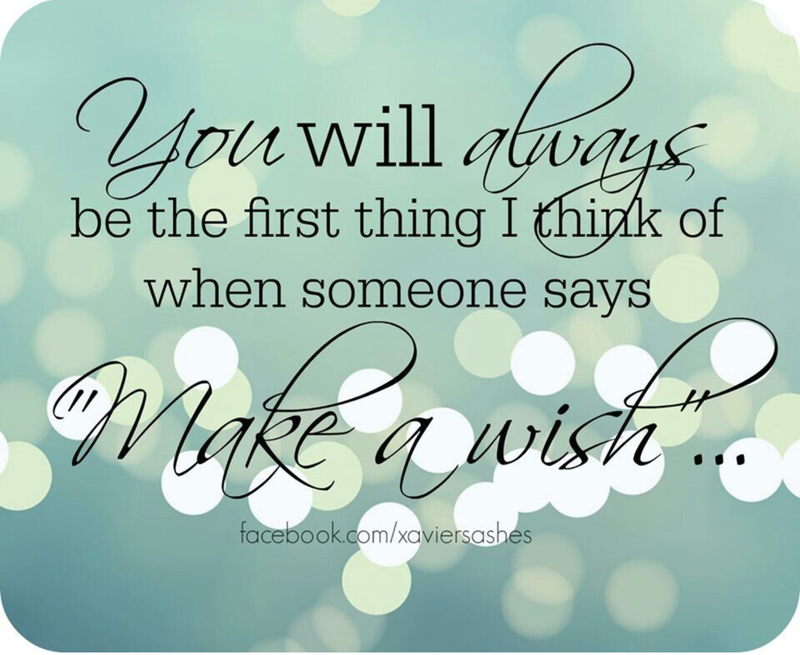 I will continue to wish for my one wish and know in my heart that each 2-2 day brings me closer. Until then I will live for you and because of you. I will soldier on remembering when our world was indeed perfect and I will miss you more and more and more. I love you, Willy. Like a bus in a perfect world. Hey sweet one, wanted you to know how necessary you have been to the introduction of my new knees to my old body and the healing that must take place in order for us to get along in the active life I long for and miss so much. Getting these two new knees has not been an easy road and although I knew it would be challenging there have been some days that I had to lean on you more than I thought I’d need to. Don’t get me wrong, I don’t regret having the surgery and am happy everyday to report that the chronic, achy, “migraine in my knees” kind of pain is gone! I have no more osteoarthritis and my legs are straight. I’m taller, Will! Not quite the Jana Hart kind of tall, but for the record — I. Am. Taller. And, the cowboy boots I wore to Dina’s special dinner looked awesome, not that you’d really care about that. One of the most difficult parts of this and one that I am a bit surprised has hit me as hard as it has is the depression that is common to the post-surgical healing process. Before surgery the medical team did talk about it and they stressed that there would be resources available to support me through it should I need it. I consider myself “quite” aware of depression and how it can rear itself in my body and in my mind but it goes to show that knowing about and being aware of depression doesn’t mean you don’t experience it. The reality of the weeks and months of healing and the patience and work that it requires isn’t surprising – that wouldn’t be the right word – maybe restrictive is the better way to explain it. And with restriction comes feelings of isolation that in turn affect my self-esteem… then along comes some feelings of worthlessness… and round and round it goes. The days can be too long, Will. After my surgery, while still in hospital a social worker stopped by my room and we had a chat about how I was feeling post surgery and what kinds of thoughts and feelings could present once I went home. We talked about depression and PTSD and I shared my story of losing you and how I knew first hand what depression and PTSD was. She listened while I shared my belief that as a mother who’d lost a child there would never be anything worse in my life or nothing that I could not handle going forward. My certainty in those words is as strong as it will ever be and that is what gets me through the sometimes dark moments of depression when I wonder just for a moment where I will find the strength to overcome the feelings of “I don’t know if I can”. It felt a little like the table had been turned when it was she who shed a few tears and we even laughed for a moment about it; how it was she who’d been given a takeaway moment instead of she delivering one to me. You see, Will, she was a Mom too. “Your healing road will have bumps and hurdles,” she said, “but you’ll be just fine.” And, I’ve no double that I will be. You, little blue, are my inner strength. It is you that pulls me up, that gives me the extra uuumph that I need to heal these knees and get on with it. Your whispers, “C’mon Mom” and your hands in mine are the ever-present reminders that my new knees and I will get to know each other and we’ll be just fine. Love you, Will. Like a bus, of course. With brand, new wheels! As I turn the calendar to the last days of May I am relieved that 1) I made it and 2) the overwhelming sadness that I associate with May is behind me again for another year. I am often asked if losing you gets easier with time and the answer to that is no, 100% absolute no. It is not one bit easier. There is still a sting, an emptiness, and an ache deep inside that can make it hard to breathe. Still. I still wonder every moment how this can happen and why parents sometimes outlive their children when it just should never, ever be. I struggle still with not being able to touch you, to physically see you in your body and believe me, I will miss that forever. Where I do find comfort, and where I seek it is in all of the things and places that I believe you are. I believe it’s you because I can feel you. Sometimes its that feeling of déjà vu and sometimes it’s the way you feel when you think somebody is looking at you from the other side of the room, only there is nobody there… except you. I believe you are those little blue butterflies in the spring and the heart-shaped rocks that find their way to my pockets and to my home. I believe you are the magnificent rainbows and double rainbows that wow me, and that you are the very sparkliest snowflakes in every blanket of Willy that falls to the ground. I know that you are the effervescent dewdrops in the trees that a friend of mine says stretch up so high that they must hold up heaven. There have been moments when I’ve said your name out loud, asked if it was you, but knew in my heart that it was. Sometimes it’s the way Finn looks seemingly “through me” and not at me. I’ve seen you in the aura that surrounds the sun and in the middle star of Orion’s Belt as it twinkles so brightly in the night sky. I feel your winks and your pokes, your smiles and your gotcha’s and at the end of the day before I sleep I feel your “I love yous”. I promise you, Will, for as long as I am on this side of heaven I will continue to look for all the signs you send to let me know that you are here. I promise that I will never lose hope, or my faith in the magical power that is you and that we refer to as WillPower. I love you, little blue. More than ever and anything and a bus. I walked into a store on main street in Fernie on a summer day in 2011…. only weeks after losing you and to this day I’m not sure if I laid eyes on it first or if it laid eyes on me. It was another of those profound moments that are crystal clear in my mind and the feelings it brought forth were and still are eerily beautiful. I remember being drawn to it the moment I walked through the doors because this boy looked like you. Just. Like. You. I picked it up and in the quiet stillness that surrounded me I heard these words — “peek-a-boo, Mom”. I knew that I could not leave the store without it. Those few weeks after losing you were numbing, confusing, foggy, terribly painful and raw with emotion. I spent all of my waking moments searching for answers, for meaning, for ways to survive, for something to believe in, for a God that would promise to take me to you at the end of my days here and that for eternity nothing could tear us apart. On that day, seeing that photo, it felt like I had the answer I wanted so desperately. You see it, too, don’t you, Will? It’s as if this photo was taken from inside of me; from deep within my soul. This is what I see when I open my eyes. I see you as if you are super imposed into/onto everything that is real. It is yet another reminder that the veil is thin. And I like it that way. Peek-a-boo back at you, Willy. I see you. Love you like a bus, Will… with peek-a-boo windows from my soul. 2016. The first thing that comes to my mind is the number five. The passing of time seems always to be where my mind, without even thinking, drifts first. For fifteen days now we’re into a new year and I shake my head in disbelief knowing that it will be 5 years this May. I wonder over and over, also in disbelief, how it could even be possible that yesterday and forever can seem the same? Time is funny that way. I read a post on Facebook this morning that spoke to me in a profound way. Instantly, I thought about the words I wrote in my tribute to you – the words that Mary read on my behalf at your Celebration of Life six days after our world changed forever. I wanted to reprint them here in your letter so you are reminded of what I miss the most about you, Will. “Last Sunday I experienced every mother’s “unimaginable”. I lost my WillBilly. On that evening, a part of me was lost with Will as well; Partly, because I have this overwhelming need to be with him and also because at twelve years of age, quite frankly, he still needs his mom. Surrounding his passing are emotions beyond words. I recently read (not once, but three times) Katrina Kenison’s book, “The Gift of an Ordinary Day” and many of the words I am sharing with you today were born from hers and some word for word as it seems Moms everywhere convey the same kind of love. I often find myself thinking back to when Will was really small. Days that began with cinnamon toast cut into finger size pieces and might end with made-up stories or shadow pictures on a bedroom wall. In between there were walks to the river, picnic lunches at the park, popsicles, hot wheels and miles and miles of orange track that would meander around our living room furniture. And then there was lego. Lots. And. Lots. Of. Lego. Crayola markers, playdough, puzzles, a plastic wading pool and a lawn sprinkler that could enchant a neighbourhood of kids for hours, a shallow red dish full of dish soap and glycerin, and magic wands that once waved hundreds of wobbly, irridescent bubbles into the air. As he grew, so did his world. Sports became a part of Will and as long as he had friends (and he had many) to do them with he was having the time of his life. A trampoline, a bag of candy, a pair of park skis and powder skis, fancy goggles, snow, sleepovers, bacon, his iPod, bouncy balls, Kathleen, Kale, hoodies, hats, a flannel shirt, his constant singing, his laugh and most of all a family who loved him beyond words were all that mattered. Simple, ordinary pleasures. It’s still hard for me to believe that all of this has vanished, that those times are truly gone for good. Thankfully, what I have now are countless, beautiful memories that scroll endlessly in my mind. Memories of his constant show of affection, as well as the countless peanut butter and banana sandwiches, bedtime stories, earaches and scraped knees, baking soda volcanoes, snowball fights, trips into Bragg Creek for icecream and how I hauled his baritone sax to and from school every week because it was too big to carry on the bus. How I harped at him to finish his homework and how I had to remind him to pick up his wet towel off the floor every morning. Yet I am grateful to have had all of those moments, for they are the ones that have turned out, in the end, to be the most precious recollections of all, even though they went unrecorded, unwritten, unremarked on at the time. Our photo albums and computers are full of pictures of birthday cakes and holiday celebrations, vacation trips and family adventures. But the memories I find myself holding onto the tightest, the ones that I will cherish for the rest of my life are the ones that you couldn’t capture in a photograph. His giggle, his “I love you, moms”, his little boy arms around my neck and his final words every night, “Mom, can you tuck me in?” followed by, “I love you like a bus.” Quite simply, a family’s life as it is from one hour, or day, or season, to the next. The most wonderful gift we had and the gift I will cherish above all else, was the gift of all those perfectly ordinary days. What I want you to always know, Willy, is that I couldn’t miss you more than I did back then or more than I do now. All of those perfectly ordinary moments have become what I cherish most in life. They are the movie that plays over and over and over in my heart. … I love you like a bus, Willy. A big, ole ordinary bus with perfectly ordinary wheels. 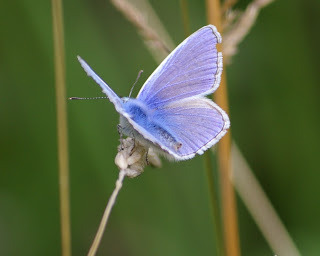 While walking Finn down by the river this afternoon I noticed the little, blue butterflies were visiting again. I’ve missed seeing these little beauties, as these were the first I’ve seen since last summer. First there was one, then two… then three, all fluttering about in the sunshine, stopping here and there, up and down and all around — going nowhere it seemed, or certainly not in a hurry if they were. I smiled wondering if they were you… and in the same breath, of course, they were you. I slowed my pace and began to talk to them, extending my hand and then stopping to just take it all in. I asked them, “is that you, Willy? Is it you? Is it?” They continued to flutter about always coming back to where I could almost reach out and touch them. They stayed close, stopping and starting in unison as if I was leading some sort of dance. For quite some time I was oblivious to anything else. Their delicate, little, blue wings so perfect and the way they’d stop and rest on a dandelion or a leaf or a blade of grass while their little wings moved as if that is how they breathed. Little ins and little outs. And then off they’d go, their wings moving so effortlessly and so quietly amongst us. I needed to see those little, blue butterflies today, Will. A sign from you that you are here, that you see us and hear us and love us still. These past few days have weighed heavily on my heart and to see the weightlessness of love in the wings of a little blue butterfly instantly picked me up. I hadn’t realized until that moment just how fragile I was feeling today. For a few days, I didn’t want to open my eyes and instead closed them tight for fear that the river of tears inside of me would spill. I’d been walking with my head down instead of up, not seeing the beauty in little things…until I saw the little, blue butterflies this afternoon. For the rest of my walk I longed to touch you, to see your face, to hear your voice and in the quiet of my afternoon walk I did try, but the only sight and sound was in my memory. I sighed. But I will never give up on my belief that you are here. Just a blink away. Somewhere over the rainbow. On the other side of the veil. I’ll be out again tomorrow Will, on the same river path as today. And I’ll look for you again… because those little, blue butterflies get me every time. Love you, little blue. Like a bus full of those little flutterbies.